A rescue helicopter had to use the full length of its winch to rescue an injured climber after a fall in the Cairngorms. It took the crew of the Inverness Coastguard helicopter almost three minutes to reel the man and the aircraft’s winchman up from the mountainside on Wednesday. The climber fell from a route in Coire an t-Sneachda on Cairngorm, suffering a suspected broken ankle. 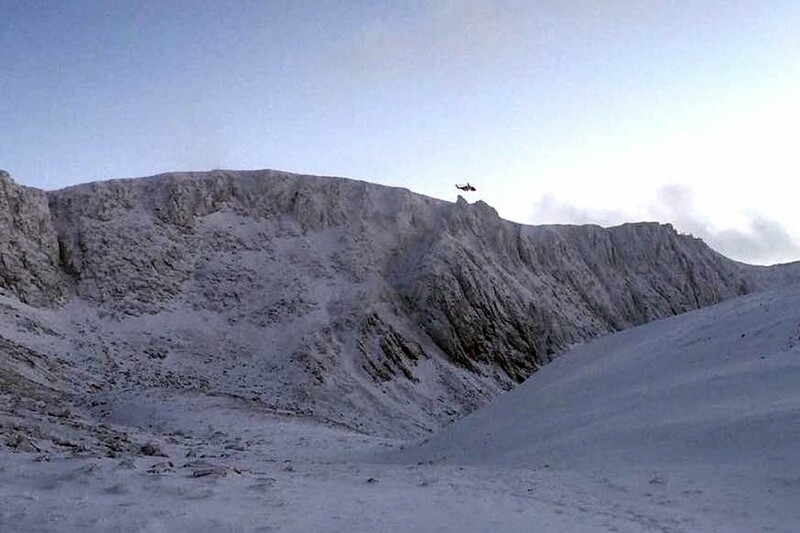 Cairngorm Mountain Rescue Team was called out and the helicopter crew was alerted shortly before 4pm. The helicopter, which was on a training exercise in the area, arrived at the site in just over 10 minutes. The man’s climbing companion was helped to safety by the mountain rescue team. A crew member said: “Trying to land a helicopter in these conditions is just not going to happen. “Getting any closer to the mountain and we would have risked causing an avalanche. It must have seemed like a long time for us to reach the climber but this was the safest thing we could do under these treacherous conditions. The injured climber was flown to Raigmore Hospital in Inverness for further treatment.